Some saijiki list this as a spring kigo. This festival takes plase at a Temple in Mizusawa Town, Iwate prefecture in Northern Japan, during the coldest month of the year. According to the Old Lunar Calendar, it is the night of the Old New Year, from day seven to eight. Men of unlucky ages (25 and 42) dressed only in loincloths take part in purification rituals throughout the night, climaxing in a vigorous struggle for wooden charms. It is also called Sominsai 蘇民祭. 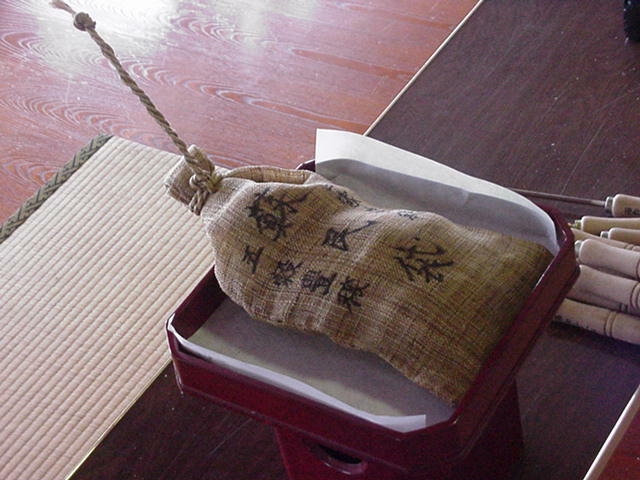 A talisman is packed in a sack (somin bukuro) and the men hustle to take hold of it. The Temple Kokuseki-Ji was founded by the priest Gyooki 行基　during the Nara period in 729 and now belongs to the Tendai Sect of Esoteric Buddhism. The festival takes place at the Hall of Yakushi Nyorai. The festival proceeds in various stages and preparations start already a month ago. It beging with a water purification of the participants, where all men poor icecold water over the naked bodies whilst shouting : Jaaso, Jaaso, Jaasa! the naked men start hustling for the sack with the deity. Two boys with a mask of the demon (onigo, oniko) on their back are carried around on the shoulders of the men. the men are divided in two groups, east and west. They keep wrestling until the sky gets bright in the east. More photos are here in our album, Nr. 01 - 07. Here is a great link in Japanese with many more pictures, including the ones above.